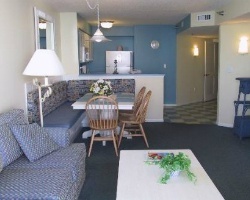 Shore Crest Vacation Villas II Myrtle Beach is the ideal escape for you and your family. And when you buy or rent a timeshare through SellMyTimeshareNow.com, you can save thousands of dollars off the developer price! What’s My Shore Crest Vacation Villas II Timeshare Worth? Vacation on beautiful Myrtle Beach marshland while being mere steps away from the beautiful shores with a Shore Crest Vacation Villas II timeshare resale or rental. This desirably located resort is just minutes away from scenic golf courses, upscale shopping, a wide range of dining options, and lively entertainment year-round! The resort itself is the perfect place to relax after a long day of visiting the local attractions. Enjoy a heated pool, hot tub, game room, and even a Lazy River to float around in. The whole family will love this fun-filled getaway spot with ample conveniences and luxuries at every turn. Spacious two-bedroom Shore Crest Vacation Villas II timeshare accommodations are available and comfortably sleep as many as six guests. Well-appointed with full kitchens, washers and dryers, private bedrooms, and multiple bathrooms, you'll feel right at home with plenty of space to spread out and relax. The best views of the weekly Barefoot Landing fireworks can be taken in from your very own private balcony overlooking the beautiful marsh landscape. 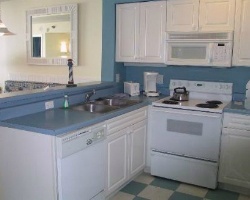 Oceanside one- and two-bedroom accommodations can be found at Shore Crest Vacation Villas I. Let us help you find your perfect Shore Crest Vacation Villas 2 resale or rental now. Start by filling out the form on the right for more information, or talk to us directly by calling 1-877-815-4227. You might be wondering, what is that makes buying a Shore Crest Vacation Villas 2 on the secondary market so much less expensive? 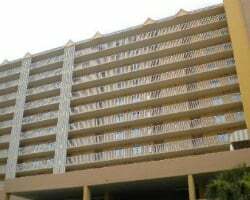 When you buy from the resort, you not only have to deal with a high-pressure, lengthy sales pitch, but you also end up paying hidden sales commissions and additional fees that are tacked on to the price of the actual timeshare ownership. On the resale market, owners advertise their timeshares for their true market value with no hidden fees and no commissions. This can save you as much as 70% for the exact same ownership—resale is really a no brainer! Our inventory of Shore Crest Vacation Villas II Myrtle Beach timeshares features a great selection of deeded floating and points-based timeshare weeks with annual or biennial usage. All Bluegreen Resorts timeshares are assigned a specific points value, and these points can be used to customize your vacations so that you can still get away when your needs and wants change. Choose when, where, and how long you travel for, ensuring you can always make time for a great retreat. As Shore Crest Vacation Villas II is a Bluegreen affiliated property, resale owners get to enjoy all the member benefits of Bluegreen Vacation Club. This flexible points-based ownership allows you to customize your vacation each time you travel. Use your allotted Bluegreen points to not only determine when you travel this year, but use them to internally exchange for a vacation at other Bluegreen resorts. With dozens of great properties to choose from in high-demand destinations, you will always be able to mix up your vacation and travel to new and exciting locations each year. Shore Crest Vacation Villas II timeshare owners have thousands of additional exchange options in addition to the ones available within Bluegreen. The resort is fortunate enough to be affiliated with both of the world's leading external exchange companies, RCI and Interval International. With the purchase of one or both of these affordable annual memberships, you can enjoy vacations at thousands of resorts across the globe by simply exchanging your week or points at Shore Crest Vacation Villas II. As an added bonus, Shore Crest Vacation Villas II is an RCI Gold Crown rated resort, allowing you to enjoy the highest level of trading power within RCI's vast network of vacation ownership resort affiliates. Myrtle Beach is famous for its incredible golf courses, pristine beaches, and nonstop entertainment everywhere you look. 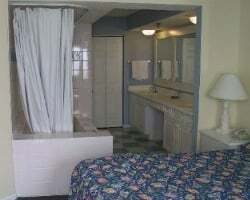 You will be able to enjoy all of this and more with a vacation at Shore Crest Vacation Villas II. A great and relaxing homebase, you'll find great amenities on-site such as a Lazy River, heated pool, hot tub, game room, and a picnic area with BBQ grills for an outdoor family picnic. Step outside the resort for endless attractions and activities. Being so close to the water makes it easy to go fishing, boating, water skiing, and even windsurfing! Play a round on one of the dozens of nearby courses, enjoy lively entertainment at Broadway at the Beach or Barefoot Landing, eat out a the Hard Rock Cafe, Wet Willie's, or Senor Frogs, or go on a shopping spree at one of the many outlets and boutiques. Myrtle Beach boasts something for every type of traveler with every type of interest, making it a great destination for your yearly retreat! Already Own at Shore Crest Vacation Villas II?